Flatbreads such as this one are great cut into small strips and served as bread with your meals, or cut into larger squares and used to make sandwiches. This focaccia is a little different than most that I make in that I use a biga or starter made the day before. I find the biga gives this flatbread a little more depth of flavor and a little firmer texture while still maintaining a light bread. For a change, I studded the top of this focaccia with black, imported olives, and substituted 2 cups of the all-purpose flour for white whole wheat flour from King Arthur’s. I wouldn’t suggest using regular whole wheat dough however, as the bread would be too dense. If you don’t have access to the white whole wheat flour, simply use all-purpose unbleached flour. 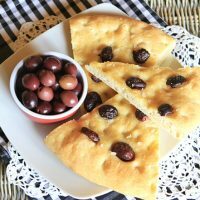 Although this bread is great on it’s own, it is one of my favorite focaccia recipes to make for sandwiches. By varying the size of the pans, you can create a thinner, crisper crust, or a thicker, softer one ideal for sandwiches as I have made here. I find that black, imported olives to have a richer, earthier flavor that works much much better in breads than green olives, but you try try green if you prefer, or even a mix of the two. This bread freezes well, so you might want to double the recipe. 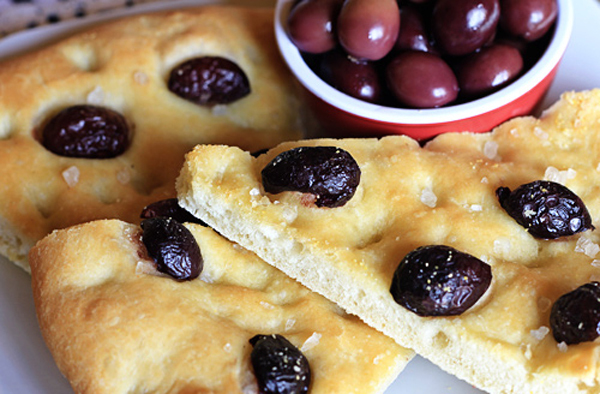 Instead of placing the olives on top of the bread, you could also chop the olives and work them into the dough itself. Use the most flavorful black olives you can find for the best results. For The Biga: Mix the yeast and water together, and then slowly start adding the flour, mixing well. Cover with plastic wrap and let sit at room temperature for up to 6 hours, and then refrigerate overnight. 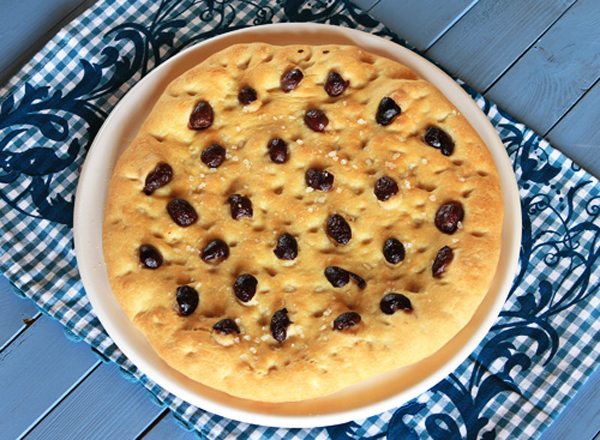 Focaccia: Measure and assemble your flour, biga, 2 tablespoons olive oil, salt, yeast, and water. Add everything but the water into a large bowl and stir. Add half the water and stir, then continue to add water until the dough begins to come together into a shaggy ball. Dump the dough mixture onto a lightly floured surface surface and begin to knead with the heels of your hand. Knead for about 5 minutes, or until the dough is smooth and pliant. Add a little oil (2 tablespoons) to the bottom of a large bowl and place your ball of dough inside. Roll the ball around in the oil, ensuring the sides of the bowl, and ball of dough are both lightly oiled. Let the dough rise until it is doubled in size, about an hour or an hour and a half depending on ambient temperature. Sprinkle cornmeal over two large baking sheet. Divide the dough into two equal balls, and take one ball art a time and use your hands to begin to press into a flat disc. Use the heel of your hand pushing from the center out, turning the circle of dough as you go until you create a circle about 12 inches across. Place each round on a prepared baking sheet, cover with kitchen towels and let rise for 20 to 30 minutes until soft. 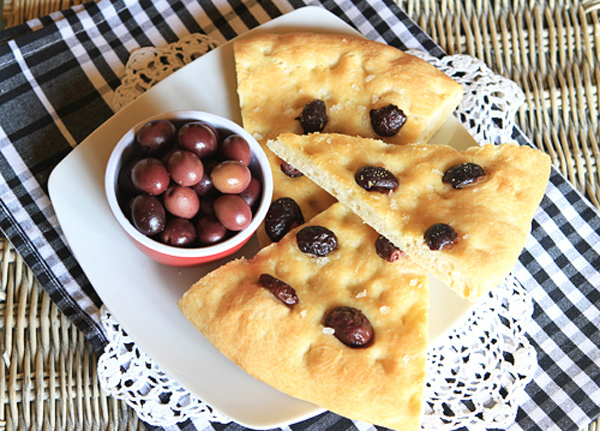 Dimple the dough with fingers, drizzle with remaining olive oil, and divide the pitted olives evenly over the top of each focaccia, then sprinkle with sea salt. Let it sit and rise for another 15 minutes while you preheat your oven to 425 degrees F.